By now, my weakness for all things pumpkin is likely apparent. Particularly on chilly fall mornings, when I look out the window upon sprays of crimson leaves on the trees and piles of their soggy, brown counterparts on the ground, I feel a strong urge to mix up a something pumpkin, spiked with cinnamon, and slip it in the oven. My love of pumpkin has deep roots, evidenced by one of my first pen names. When I was growing up, my mom set up a writing club. We met once a week, rotating between the members’ houses, and read pieces we had written that week out loud. Any type of writing was allowed, and I remember poems, mystery stories in installments, romances, and one girl who always wrote about horses and their young, female owners (who usually had long, blond hair, as I recall). Every so often, we compiled a publication of all our compositions using pen names. Mine was always “Mrs. Pumpkin Pie.” So, as you can see, my affair with pumpkin has been going on for a long time. And who could blame me? Now, I know pumpkin pie is technically a dessert, but I have always loved eating it for breakfast most of all. When I was little, the day after Christmas, my grandma always suggested we eat pumpkin pie for breakfast, and I still think it’s an excellent idea. It’s a bit hard to justify pumpkin pie at 9 a.m. on a day-to-day basis, though, so I had to come up with a healthier alternative. The best bet seemed like a baked oatmeal version. This little pudding is sweet but filling, creamy and full of spice, and, of course, packed with pumpkin flavor. I tried this a number of ways. (I couldn’t resist the opportunity to experiment; what a perfect excuse to eat this every morning for a week!) In the end, I came up with two versions, and couldn’t decide between the two, as they both have their advantages, so I am giving you both. 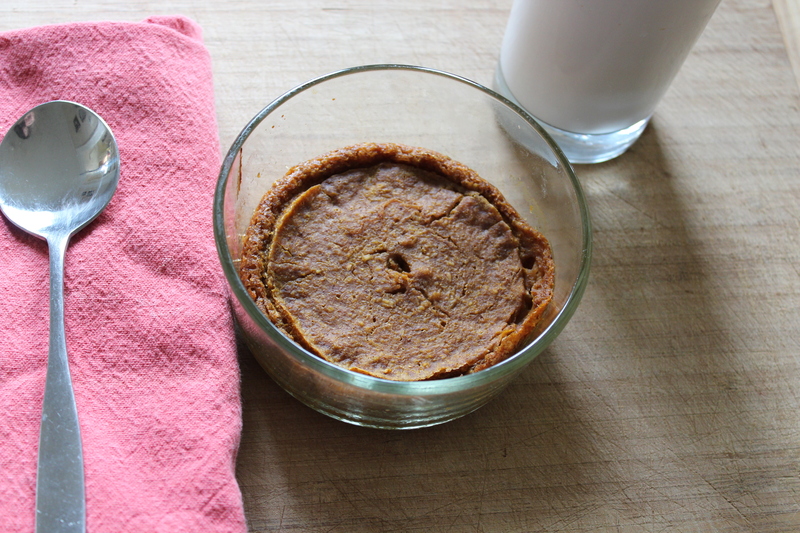 The first, Pumpkin Pie Breakfast Pudding, is creamy and has the texture of a baked custard. The second, Pumpkin Pie Baked Oatmeal, tastes more like a traditional baked oatmeal dish, with a more dense texture, almost like that of a very moist baked good. Speed it Up: This does take some time to cook, but the prep time is less than five minutes. You could pop it in the oven before hopping in the shower, or serve it on a relaxed, weekend morning and get back in bed after you slide it in to bake (at least for the second version; the first requires some supervision and adjusting of temperatures). When you need something quick, though, I actually think this makes a fabulous breakfast shake. The first couple times I made it, I ate so much of it before putting it in the oven, that I had to redo it to get accurate baking times for the actual recipe amount. Oh, and before I give you the recipe, don’t forget to enter my drawing for a FREE $10 Amazon gift card!! All you have to do to enter is sign up to follow The Joyful Pantry. There’s just one day left before the giveaway ends, so sign up soon. For more details, see the information on the home page, under the picture of the gift card. 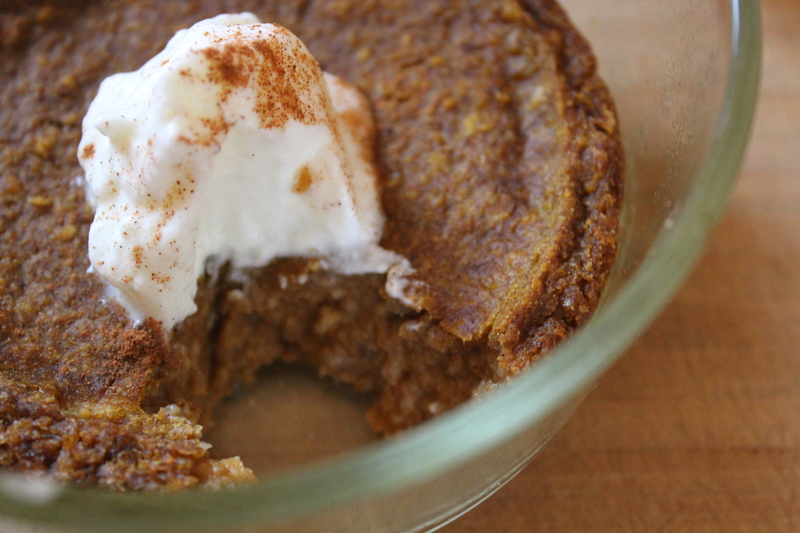 This single-serving pudding tastes like pumpkin pie, but is a breakfast-worthy substitute. It’s packed with oatmeal and pumpkin, then lightly sweetened and spiced with cinnamon, ginger and cloves. The creamy inside forms a thick pudding, delicious with a dollop of vanilla yogurt or, of course, whipped cream. This recipe makes one serving in a 4″ circular pan, but you could split between two small ramekins for smaller servings to go along with something else, or triple for a 9″x5″ bread pan. You can use any type of milk here; I like Almond Breeze original plain almond milk. Preheat oven to 425 F. Grease a 4″ round glass pan. Puree all of the ingredients in a blender or food processor until as smooth as possible. Pour into pan and cover with foil. Bake for 15 minutes. Reduce heat to 350 and bake another 10 minutes. Remove cover and bake another 35 minutes or until mostly set in the middle. A knife will not come out completely clean, but the middle won’t jiggle when you shake the pan. 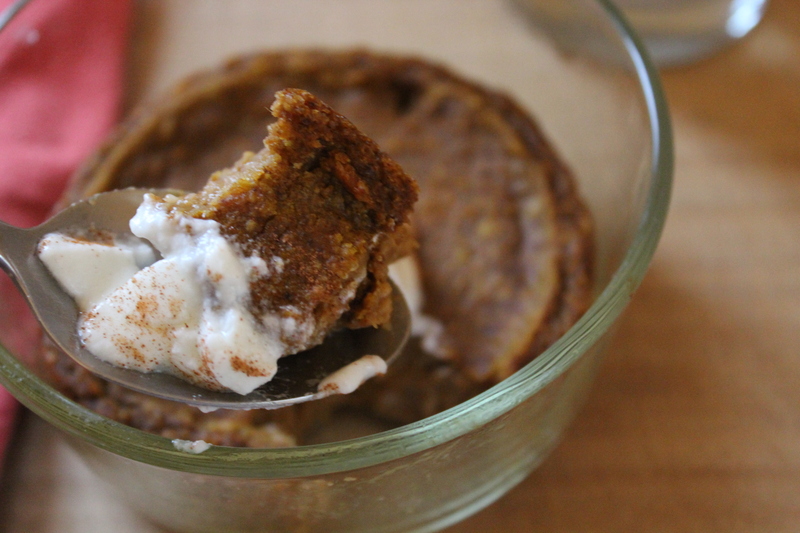 This delicious breakfast has a similar taste and texture to pumpkin pie, but is full of fiber and low in sugar and fat. It’s lovely even plain, but can be dressed up with a dollop of vanilla yogurt or whipped cream. This recipe makes one serving in a 4″ circular pan, but you could split between two small ramekins for smaller servings to go along with something else, or triple for a 9″x5″ bread pan. You can use any type of milk here; I like Almond Breeze original plain almond milk. Preheat oven to 375 F. Grease a 4″ round glass pan. Puree all of the ingredients in a blender or food processor. Bake for 30 to 35 minutes or until a knife comes out fairly clean. These look so delicious! What a great idea! I will have to try this soon. Thank you! This look very tasty and yet another way to get some vegetable matter on the breakfast table. I’ve just opened a bunch of your recipes to check out from your home page – love how they are so easy to access. And I’ve subscribed as well – Thanks! Your breakfast pumpkin puddings look great. I only wish I could cook more right now! Oh my gosh, yum!!!! I would eat this for breakfast, lunch, dinner, AND dessert! !